The Hotel Alcazar was a luxury hotel in St. Augustine, Florida, built in 1887 by Henry M. Flagler, the founder of Standard Oil. He was introduced to Florida by his wife’s doctor, who thought that a warm winter would do her poor health good. If it did anything, it wasn’t enough to keep her alive because she died a couple of years after starting her winters in Florida. Flagler apparently didn’t blame Florida, because when he remarried (his first wife’s caregiver), he and his new wife went to St. Augustine for their honeymoon. Flagler loved St. Augustine but found its hotels lacking, so he built a couple of hotels. He also found the transportation system lacking, so he built himself what would become the Florida East Coast Railway. The site on which Flagler chose to build the Alcazar (I don’t know why) was once a creek bed. So he did what any millionaire would do: he bought a farm outside of town for the sole purpose of using its dirt to shore up the Alcazar site. The farm was two miles north of town, on the former site of Gacia Real de Santa Teresa de Mose (Fort Mose for short), the first legal settlement for African-Americans in the US. The Spanish chartered the Fort Mose in 1738 as a sanctuary for Africans fleeing slavery in the English colonies north. 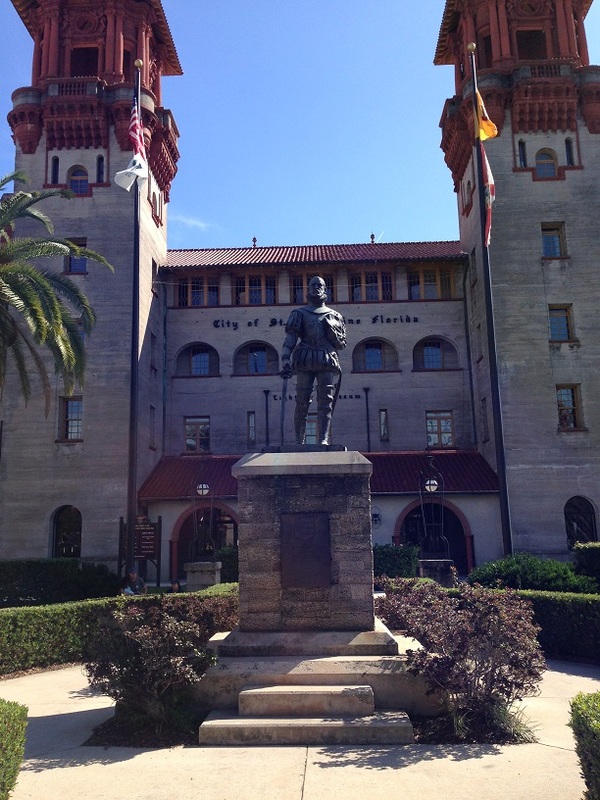 So in 1885, Flagler takes soil from the site Fort Mose once occupied and moves it to his hotel site in downtown St. Augustine. The hotel closed in 1932 and it was bought in 1946 by publisher Otto Lightener, as a place to display his collection of Victoriana. Part of it opened as a museum in 1948. Which is how the archeological remains of the first free African-American settlement in the US ended up under the Lightner Museum. The Lightner houses mostly decorative arts, although there are science and natural history objects as well. And it’s no longer just Victoriana. There are objects from Regency England through America’s Gilded Age. 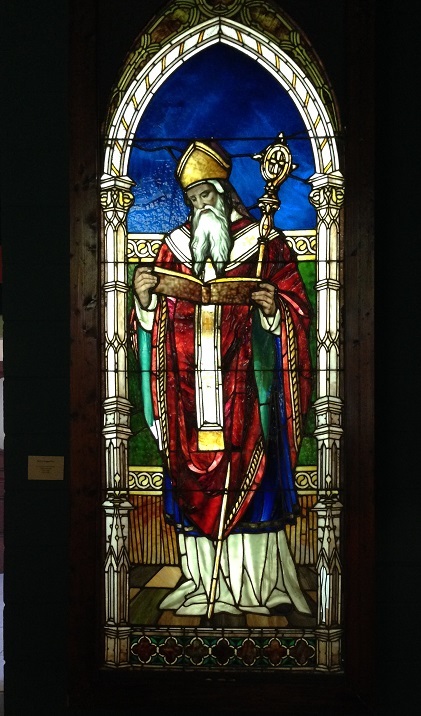 The stained glass window of St. Augustine is circa 1900 Tiffany. 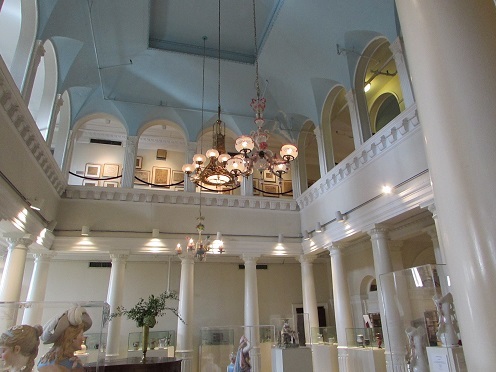 The gallery space in the photo directly above was once the Alcazar’s ballroom. Across the street from the Lightner is the other Flagler hotel, once called the Ponce de Leon. 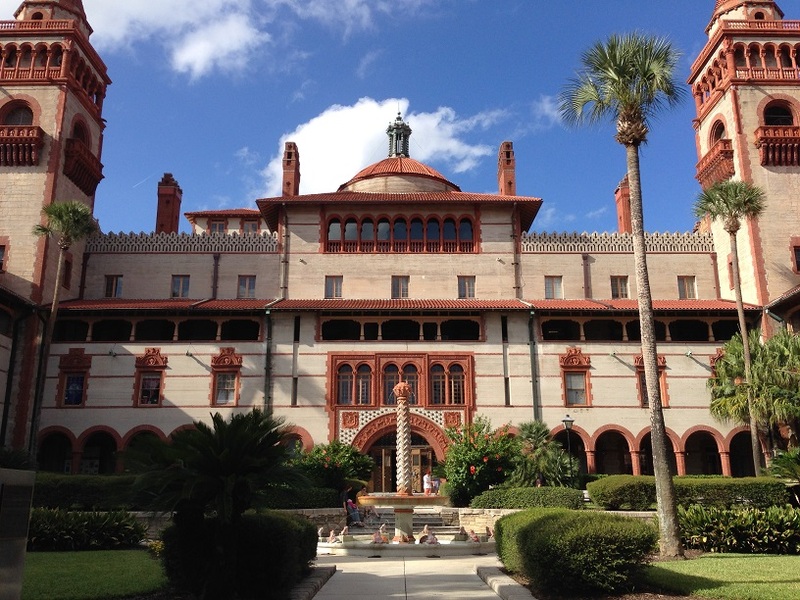 It is now houses the women’s dorm at Flagler College, a small, private coeducational undergrad institution. I recently saw a list of the 10 most beautiful colleges in the US. I couldn’t believe that Flagler wasn’t on it because it is beyond stunning. That’s the courtyard in front of Ponce de Leon Hall. What was once the hotel lobby has this gold dome, the work of George Willoughby Maynard, who also worked on the Library of Congress. I would have liked to have seen the dining hall, which has Tiffany stained glass windows and the ornate Flagler Room, which was once the women’s parlor. But they’re in an area of the dorm that’s off-limits to tourists. The school does do historic tours highlighting the architecture of Flagler, so I’ll just have to make arrangements to take it some day. 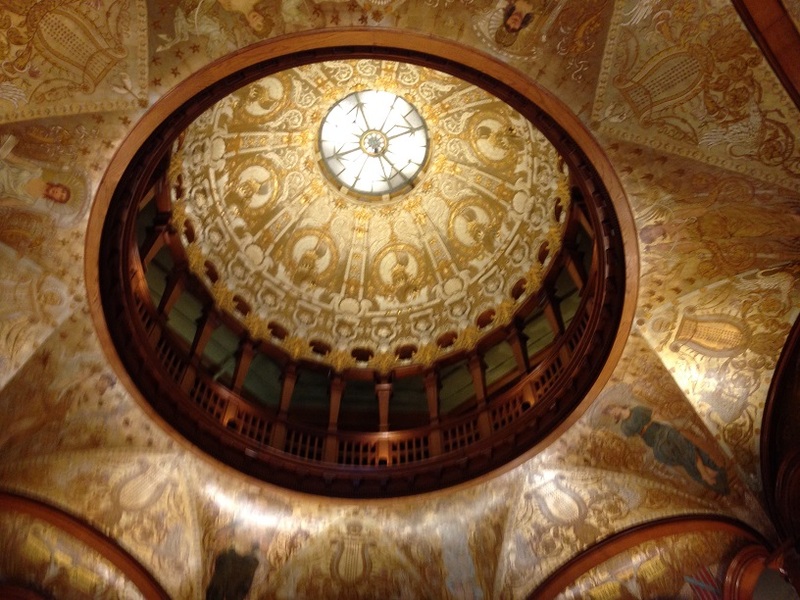 Gallery | This entry was posted in Florida and tagged Flagler College, Fort Mose, Henry Flagler, Lightner Museum, Otto Lightener. Bookmark the permalink. What a wonderful place. The last but one picture transports me straight to Andalusia! St. Augustine is very Spanish, especially architecturally. I’ve never been to Spain but it’s definitely on my bucket list.